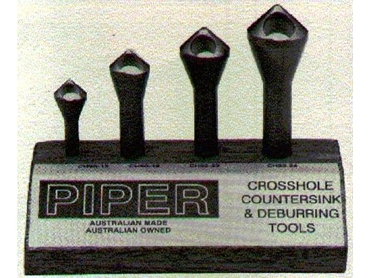 Credited with the development of one of the world’s first lathe live centres, Piper Tools , currently offers a broad range of cutting tools, lathe centres and tapping chucks. The Crosshole countersink and deburring cutter sets are part of Piper’s machine tool solutions to be used on most materials including plastics, non-ferrous and ferrous metals. • Single cutting edge suitable for use in portable drills or drilling machines. • Easily re-sharpened using a mounted point inserted in the through hole. • Manufactured from high speed steel and available in sets or singles.